Spoken language is a fundamental element of human relationships. The ability to use words effectively can help you achieve great things in life. Oral presentations are the cornerstone of human interaction on a large scale and they also have a profound effect on intimate interactions as well. Speaking in public can be a great source of anxiety for many people. However, it doesn’t have to be. People have been practicing this art for centuries and it has become an integral part of our interactions today. Some approach public speaking like a type of internal thrill ride while others are choked silent at the very thought of giving a speech. Overcoming the fear of speaking in public is a subject of great interest to many. This activity is rated among the most frightening events in a person’s life. 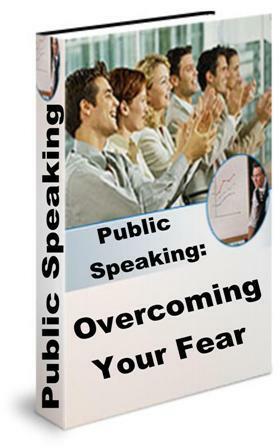 Some have gone as far as rating the fear of public speaking higher than the fear of death. Many people are able to overcome their fear of speaking in front of an audience in spite of its seemingly overwhelming nature. The process begins with a strong understanding of how public speaking functions. This text focuses on defining public speaking in a way that can help you get a handle on your fears. It is also designed to help you create strategies that will give you the means to create an effective oral presentation whether you are directing a video conference or giving a toast during a special occasion. The benefit of making associations thorough learned responses to stimuli is that these responses can be unlearned. The process does take some time but it is well worth the effort. There is more than one way to address the issue of relearning responses to various situations and objects. A wonderful technique is to take a cognitive approach to addressing your public speaking fears. This is an effective way of using logic and rational thought in a deliberate manner. It may take some time to get accustomed to dealing with emotions on a cognitive level but it is a very viable tool once you have created an effective cognitive approach. You can also retrain your responses on a behavioral level. Specialists who work in the field of behavioral psychology may refer to this as operant conditioning with a positive spin. If a negative experience can produce feelings of anxiety positive ones can create feelings of pleasure.